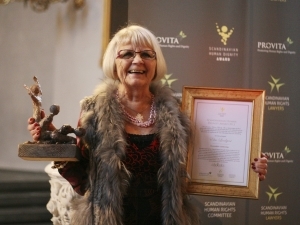 The Scandinavian Human Rights Committee chose to honor Ms Elise Lindqvist for her efforts to combat the commercial sexual exploitation of women in Sweden by granting her the Scandinavian Human Dignity Award 2013. Ms Elise Lindqvist has dedicated her life to protecting women from all forms of commercial sexual exploitation, enabling them to enjoy their fundamental rights and freedoms. The Award was presented to Ms Elise Lindqvist at a ceremonious reception on the 27th of November in Stockholm, Sweden.